At around 11:15AM, we finally arrived at Heathrow Airport. With very few hours of sleep and grumbling tummies, we were all ready to get off the plane and find some food. From the airport, we took a train to Paddington Station where some of us found the most wonderful food item ever, a steak pasty. A pasty is a buttery, flaky buttermilk pie crust wrapped around a savory mixture of steak, carrots, potatoes, and onions, seasoned well and cooked in homemade gravy. A few of us decided to share one, but after a few bites we all wanted more. Soon enough we took the tube to our hostel, YHA Thameside. Carrying a backpack & luggage along the way was definitely a struggle for us all, but no one ever complained due to the many distractions of the new environment. We soon arrived at our hostel and had a short break to set up our rooms then left to start our first day in London. While traveling around the city we were admiring its beauty, history, and uniqueness. We were blessed with great weather, with no sign of rain in the forecast. 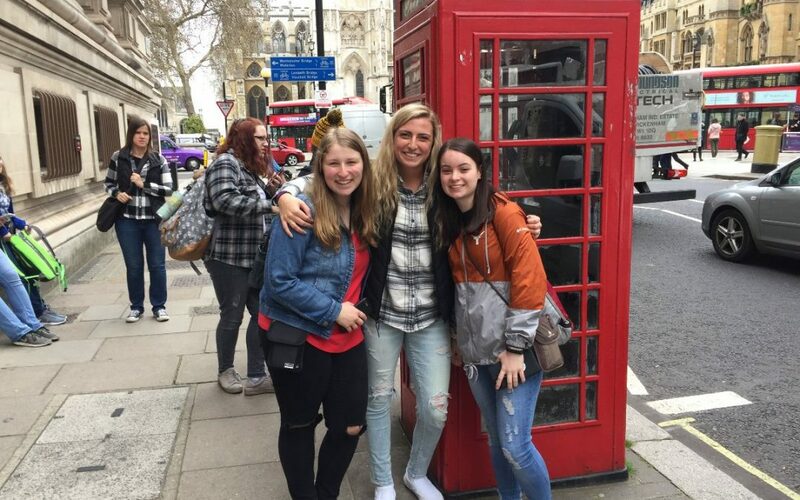 The next day we hit it hard by visiting The Tower of London, took a boat to Westminster Dock, Westminster Abbey, the British Museum, St. Martin’s Theatre for The Mousetrap, then back to our hostel for a second night in Thameside. Early Wednesday morning our coach driver, Richard, picked us up and drove us around London to the Churchill War Rooms, The Imperial War Museum, Dover, through the Eurotunnel to France, and finally to our hotel room in Boulogne, France. We ended the night eating at a restaurant near our room, Buffalo Grill and then went to bed for our busy day starting early the next morning. What a great description of a very fun, full day in London. Makes me want to be there! Thank you Ash! Great picture of you, Taryn and Samantha, too!